More than 60 people concerned about climate change attended a packed public meeting on the afternoon of Saturday 30 October to ask MP for Hazel Grove and Government Minister Andrew Stunell what the coalition was doing to tackle the problem. Stockport residents questioned Mr Stunell, Parliamentary Under Secretary for Communities and Local Government, about plans that will have an impact on people living in the area such as cutting bus and train subsidies and urged him to protect local countryside including the Goyt Valley. Audience members also called for a tough energy efficiency standard to protect tenants in poorly insulated privately rented homes and expressed concern the absence of many British solar panels manufacturers. People raised concerns over what the proposed sale of the Forestry Commission would mean for Britain’s woodlands and interrogated the Minister on how inclusive the ‘Big Society’ really was. Mike Childs, Head of Climate Change at Friends of the Earth, spoke about the importance of tackling climate change both locally and nationally. He said: “Friends of the Earth is calling for a nationwide system of local carbon budgets to help all councils get behind cost-effective green measures like insulating homes and improving public transport – creating jobs, slashing fuel bills and reducing CO2 at the same time. Dave Goddard, Leader of Stockport Council, is one of many Council Leaders who have written to the Secretary of State for Energy and Climate Change Chris Huhne in support of a UK-wide system of local carbon budgets. 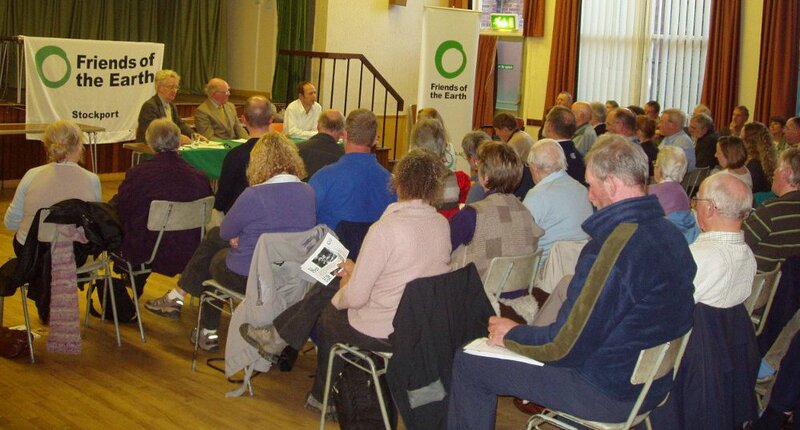 Stockport Friends of the Earth campaigner Stephen Houston said: “The meeting was a great success. It was clear that many members of the audience were passionate about the environment and Andrew Stunell had the opportunity to witness the strength of feeling among his constituents that we need to tackle climate change locally. Reverend Graham Hawley of Marple Energy Saving Strategy* chaired the meeting in Marple Senior Citizens Hall.